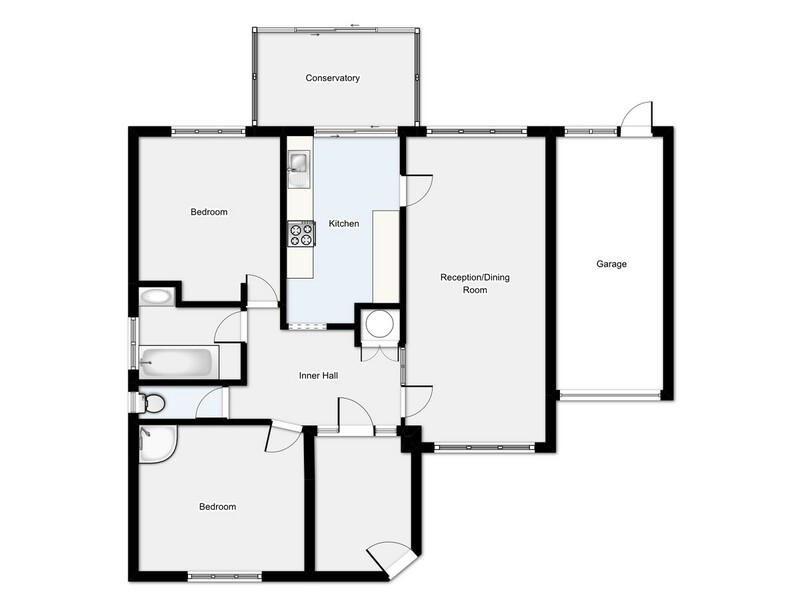 Accommodation List: Entrance hall, inner hall, reception/dining room, kitchen/breakfast room, conservatory, double bedroom with shower cubicle, second double bedroom, bathroom, separate WC. Large, mostly boarded attic space. Driveway providing ample parking, good size front garden, attached single garage, elevated enclosed rear garden, GFCH. Conservatory: 3.89m x 2.34m Floor-to-ceiling white UPVC windows to both sides and matching sliding door leading out to the rear garden. Exposed brick walls, shelves wall light point, tiled floor. Bedroom One: 3.95m x 3.48m Wood effect UPVC double glazed window to the front. Ornate coved ceiling, matching central ceiling rose. Fully tiled corner shower cubicle with glass sliding door Mira 723 shower. Bedroom Two: 3.94m x 3.32m Wood effect UPVC double glazed window enjoying views over the rear garden. Ornate coved ceiling, matching central ceiling rose. Bathroom: Obscure wood effect UPVC double glazed window to side. Fitted with white suite comprising wash hand basin set into double doored unit, panelled bath with telephone shower over. Second double doored storage unit. Part tiled walls. Inset ceiling lighting. Loft Hatch with drop-down wooden ladder to large mostly boarded attic storage space with two Velux windows to the rear. Separate WC: Obscure wood effect UPVC double glazed window to the side. Fitted with ornate decorated WC with wooden seat, part tiled walls, ornate coved ceiling and central ceiling rose. Outside: The property is approached from the road over tarmac driveway providing excellent parking and giving access to the attached single garage with up and over door to the front and personal door to the rear, housing Ideal gas fired boiler servicing hot water and central heating, light and power connected. The front garden is of good-sized mainly laid to lawn with mature shrubs and trees. A brick paved area to the front of the property with matching pathway to the left-hand side with gate gives access to the mature fully enclosed rear garden. A lower brick paved terrace with brick retaining wall inset with flight of steps leads up to a good-sized area of lawn with planted beds and borders and full height panel fenced boundaries to all sides. Two timber garden sheds. Outside tap, outside lights. Services: All mains services are connected. Gas fired central heating. Directions: Travelling south on the A28 pass through Northiam and continue for approximately 2 miles. On entering Broad Oak, pass Furnace Lane on the left at the top of the hill, Robin Hill will be found on the left hand side after a short distance.